Here it comes another comic strip for you aficionados, starring me and my sister, based on our day to day life. I did it in Adobe Illustrator, and for the ones of you who are still asking, yes, she’s really evil, no jokes! Recently my inspiration comes from my conversations with my sister and I have the impression this is a well that will never run out of water. My only problem at the moment is that I am not as fast at drawing as she is at throwing me her pearls, so at the moment I have a larger and larger waiting list of comic strips to come. What to use them for? No idea, but I think it’s a good thing to draw them down until I’ll find a use for them at a certain point in the future. I am drawing using Adobe Illustrator and a Wacom pen. Living in a place where a lot of people come an go as soon as a new opportunity comes up, meeting people that want to spend the rest of their lives here and then soon after they go is something you get used to. A few days ago this happened to a friend of my sister and this concept all of a sudden came up into my mind. It’s been a bit embarrassing: everybody was sad for her departure, and I burst into laughs. Anyway, I did this drawing using Adobe Illustrator. This is the third comic inspired by my yoga classes. I have others in my sleeve, but I guess you are getting the point: yoga is painful, despite what people make us believe on TV. I draw them using Adobe Illustrator. – I wish I were dead. This is the second comic strip inspired by my painful yoga classes. I usually work in English but these ones ended up being in Italian (my native language. 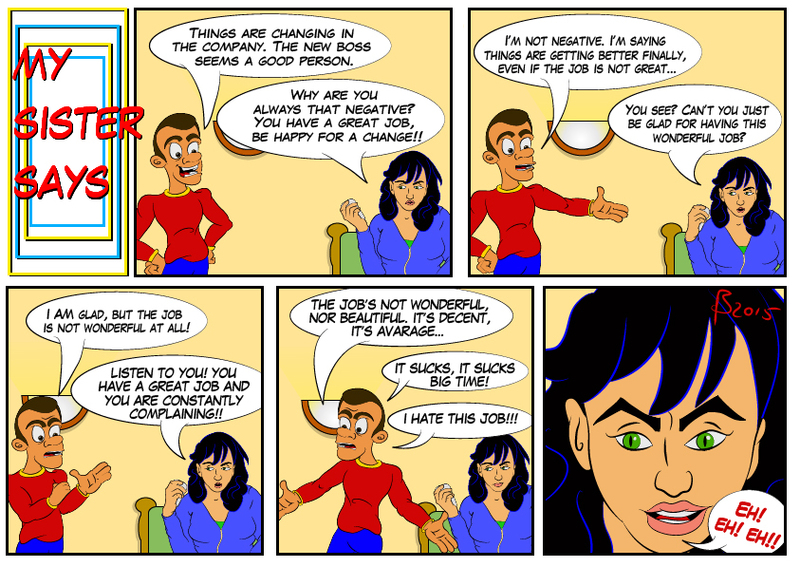 In this strip the character loosely inspired by me talks to a batender. – Today I took my first yoga class. There are some positions that make you loose your senses. – Because of the meditation? I am drawing these strips with Adobe Illustrator. Lately I have started a yoga course that triggered my creativity. Have you ever seen that image with a circle stating YOUR COMFORT ZONE, and then a dot far away stating HERE IS WHERE THE FUN BEGINS? It’s actually true: doing something new (and unbelievably painful) can really help to find new ideas. So I started drawing how painful is doing yoga, and here’s the result. To do these comic strips I used Adobe Illustrator. Here is this character loosely inspired by me. …and how others see me.